It’s December and it’s time to deck the halls! 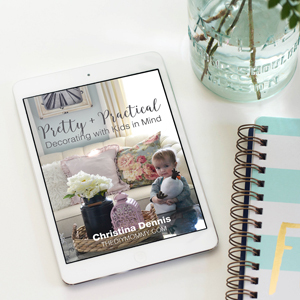 Come take a tour of Our DIY House decorated for Christmas 2017, plus get some ideas on how you can decorate your own home for Christmas. 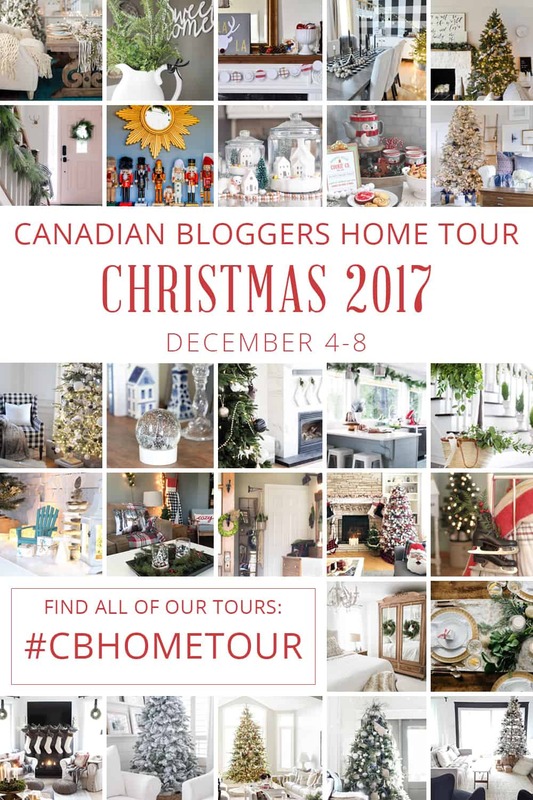 I’m also excited to be hosting the Canadian Bloggers Home Tour again this season with Shannon of AKA Design. 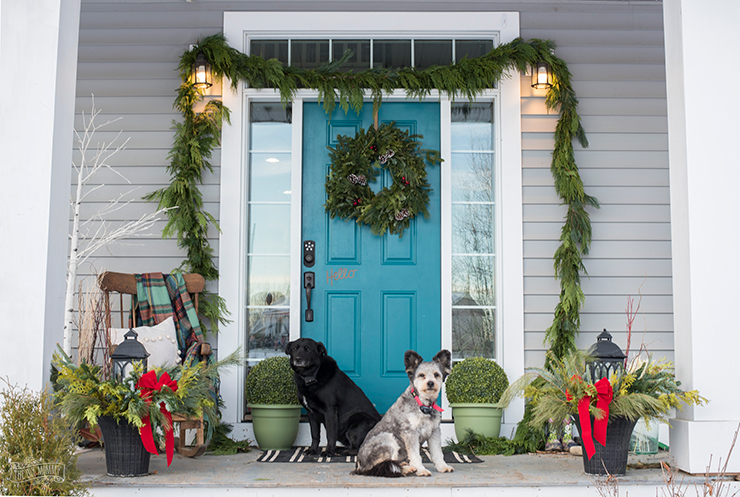 Every day this week you’ll get to tour several Canadian homes all decorated for Christmas. Make sure to visit all of the homes linked at the bottom of this post on their scheduled day. Let’s get festive! Welcome to Our DIY House! If you’re new here, welcome! My name is Christina and I live here in Alberta, Canada with my husband and three daughters. We built our home by ourselves in 2013, and you can read more about that here. 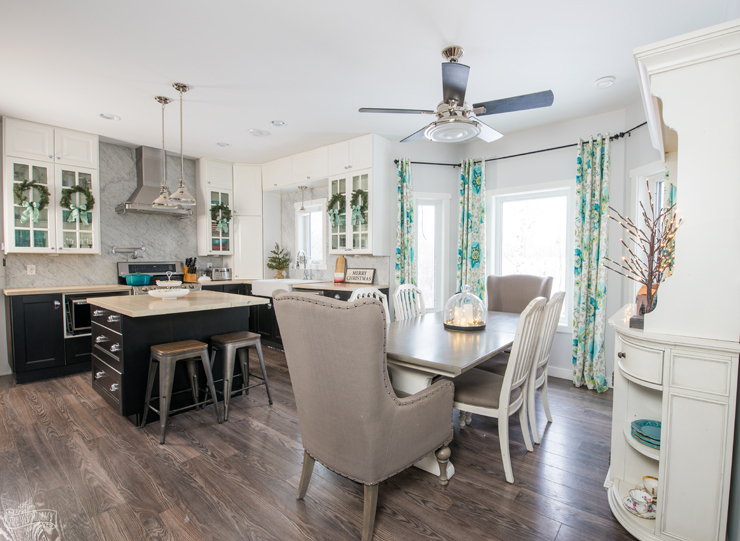 We designed it to look like a traditional four square style home, but the interior is more open concept than a heritage home. I decided to decorate the exterior of our home in a very traditional way this year. I don’t normally use lots of red in our Christmas decor, but there’s just something about big red bows on the exterior of a house that’s so welcoming and festive. You can learn how to make this extra simple Christmas lantern planters right here. I used a natural cedar and pine garland to drape around our front door, and a natural wreath I purchased to hang on the front door. I hung faux spruce wreaths on all of the lower windows and decorated them with inexpensive red velvet bows. Our living room is decorated in non-traditional Christmas colours – pinks & blues – but I’ve tried to make it feel special & festive with the addition of lots of greenery and lights. I bought one natural cedar and pin garland for inside, and then cut it into three pieces to use on the stairs and fireplace mantel. 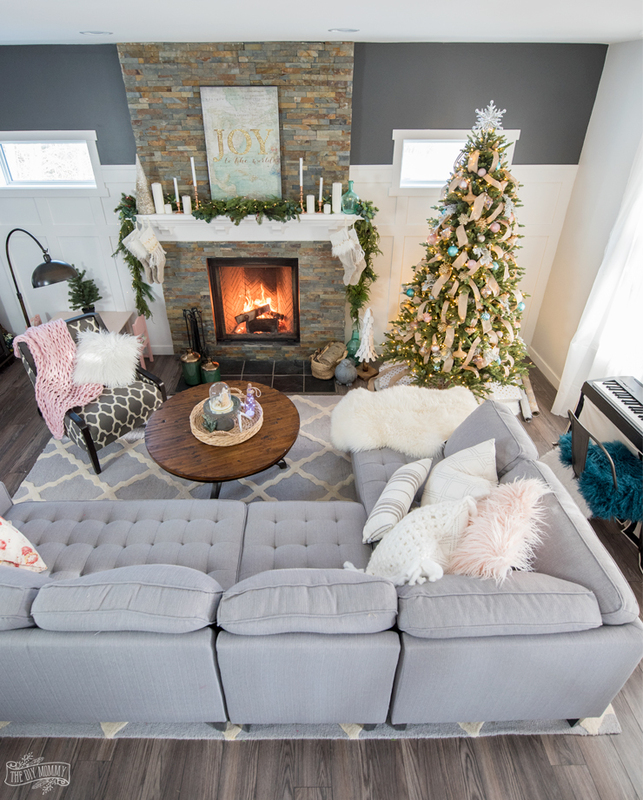 Our Paris Sectional from The Brick has definitely become our most used and loved piece of furniture in our home, and that’s especially true this time of year. It’s THE best spot to view the roaring fire when it’s cold outside, and I love that it’s big enough to hold our whole family. I’ve made it extra cozy with a DIY macrame pillow (find the tutorial here) and a DIY faux fur pillow (find the tutorial here). For our mantel decor this year, I dug out the glittery “Joy to the World” sign I made a few years ago and used it as the focal point again. I still love it, and you can find the tutorial to make it right here. The fresh greenery garland (with a few faux greenery picks added for extra body), white candles, twinkle lights, and thrifted candlesticks finish the look. I made our stockings a couple of years ago, and you can find that tutorial here. I’ll chat more about our Christmas tree in a later post, but you can see how I added the ribbon to it here. On our Cranfill Coffee Table, I’ve placed a wicker tray decorated simply with and antler, cake stand and snow globe decoration. 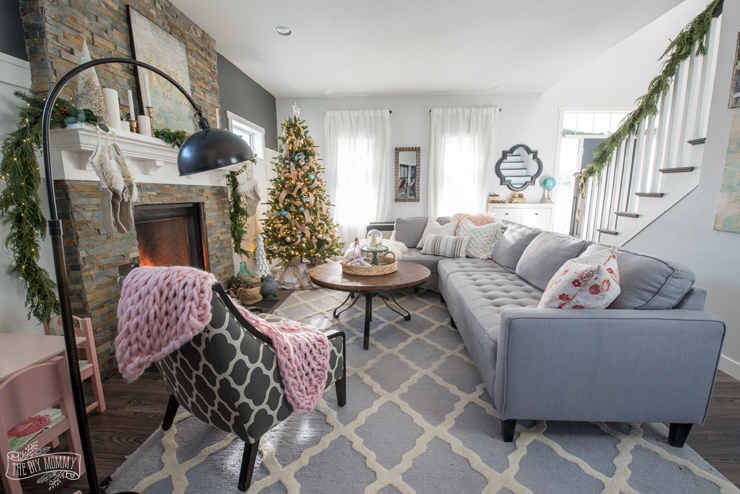 I made a pink arm knit blanket to drape over our Daphne Chair from The Brick (learn how to arm knit right here) that sits nearest our fireplace. Not only is this chair comfy to curl up in with a good book, but I love how it matches our new board & batten wall with it’s charcoal & cream tones. Around the corner from our living room is our kitchen. I’ve kept it decorated quite simply this year with the same DIY mini wreaths on the cupboard doors as I’ve used the last few years, and some simple countertop decorations. I like to keep the kitchen Christmas decor minimal because we use this space for cooking, baking and eating, and we do A LOT of that around the holidays! The only thing I’ve done differently this year is decorated our hutch with this DIY paper Christmas village we made last year with a paper stack I found at the craft store. 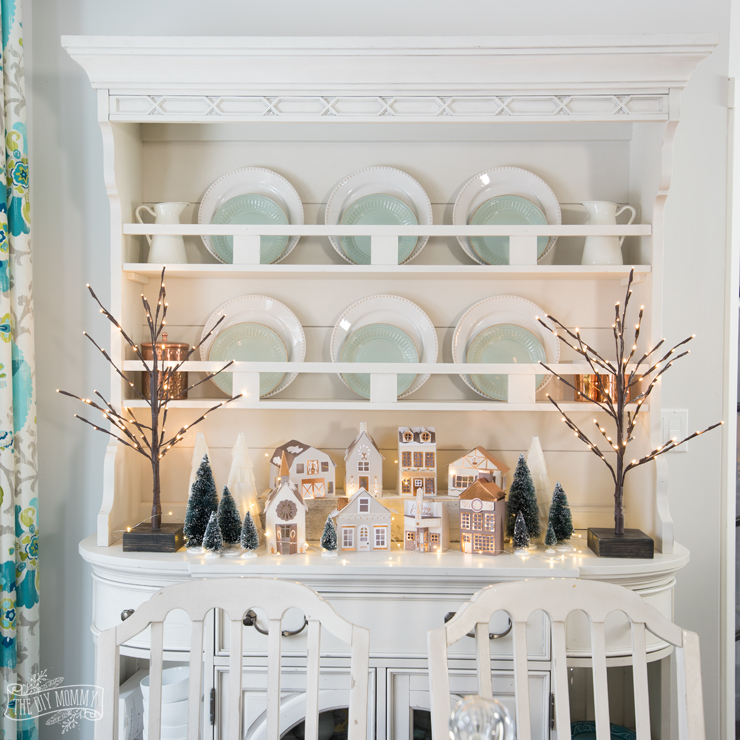 Small bits of greenery, mini lit trees and some Holiday baking help make this space feel ready for Christmas. Don’t forget adding little festive touches to your guest bathroom for the holidays! 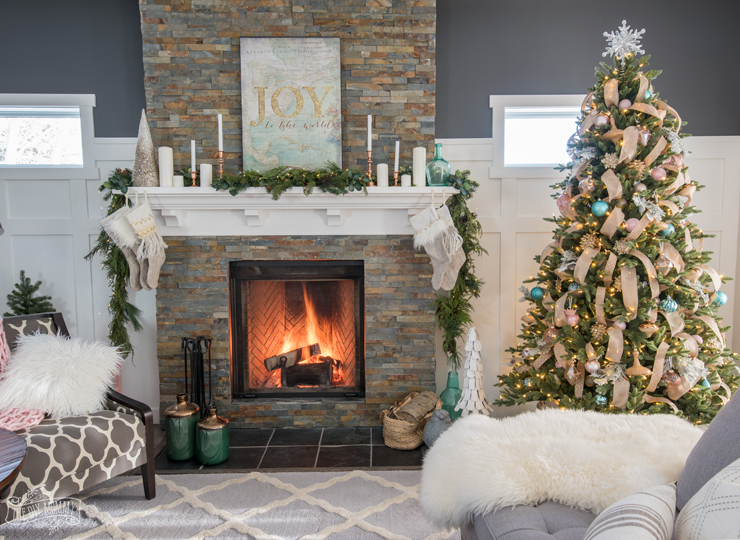 Even if it’s a simple as mine – a sparkly themed soap dispenser, some pretty towels and some faux greenery – it will help make your decor feel cohesive and special for your Christmas get-togethers. Finally, the last room I decorated for Christmas is our new dining room space. The Keswick Table from The Brick is definitely the showstopper in this room, and I LOVE that we can extend it to a full 112 inches when we have guests. I’ve already used that feature several times for dinners and parties, and by adding a few chairs and a bench, we can comfortably sit a dozen people here. I adore the colour scheme and table setting in our dining room, and you can read more details about them in this post. And that, my friends, is Our DIY House all decorated for Christmas this year! I hope you enjoyed this tour and that you found some inspiration for your own holiday decor this year. Ready for more Christmas decorating inspiration? 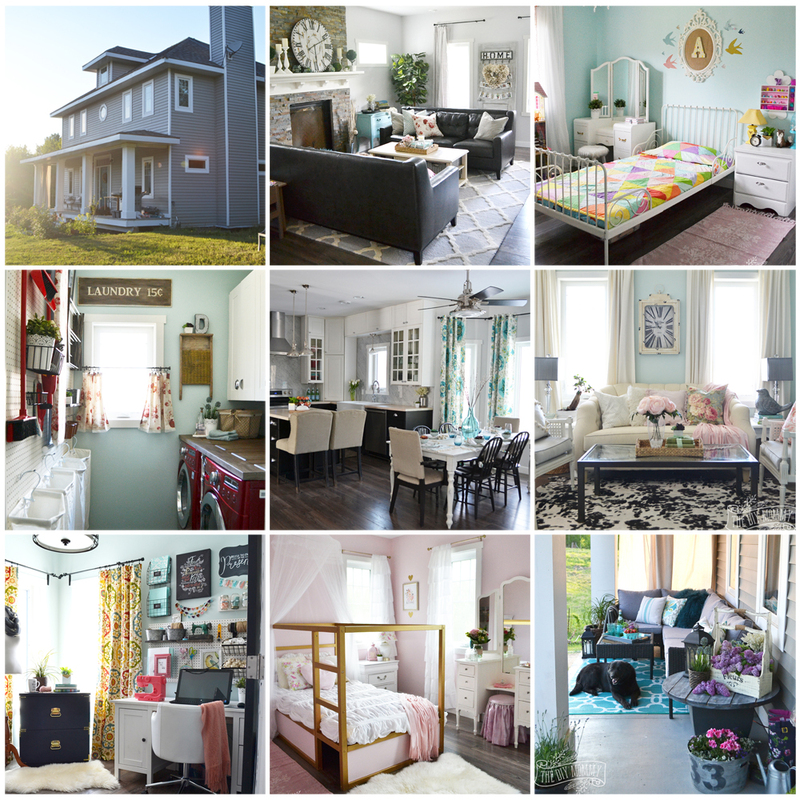 Make sure to visit the other Canadian homes featured in our Canadian Bloggers Home Tour this week! 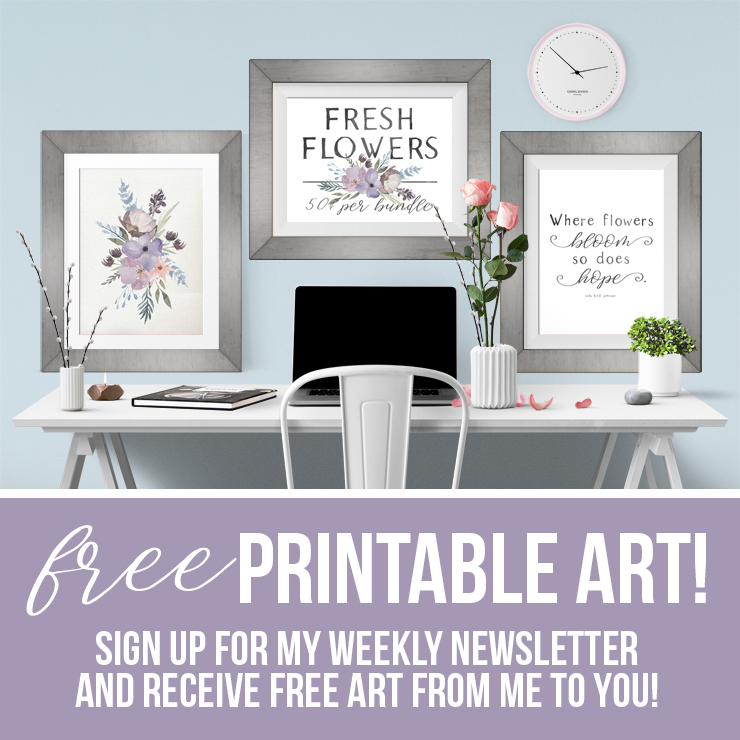 Click on the links below on the day they’re scheduled to publish, and get ready to be inspired. 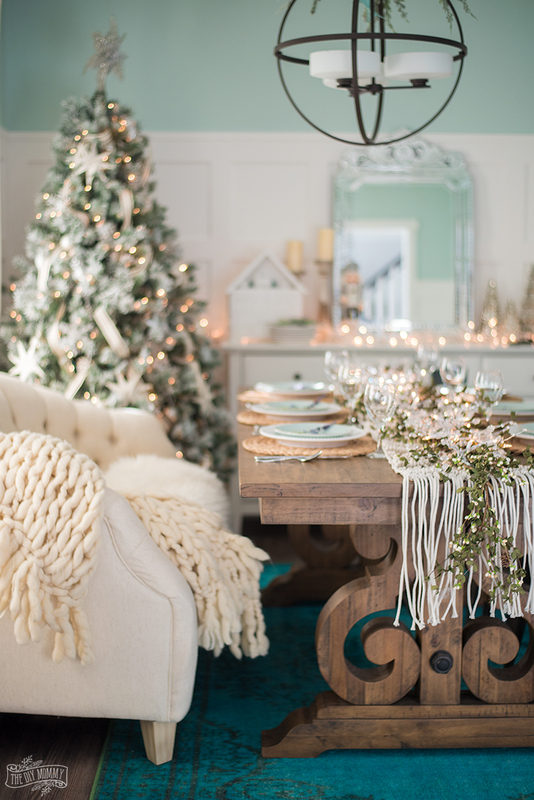 This is so pretty and and tastefully festive. I especially love your pink arm knit blanket and all the ribbon on your Christmas tree. I hope you and your family have a lovely Christmas in your beautiful home! Beautiful tour as always! I’m definitely going to have to check out your tutorial for that arm-knit blanket! Def take a look. Christina made them with and without a fringe. Gorgeous!!! 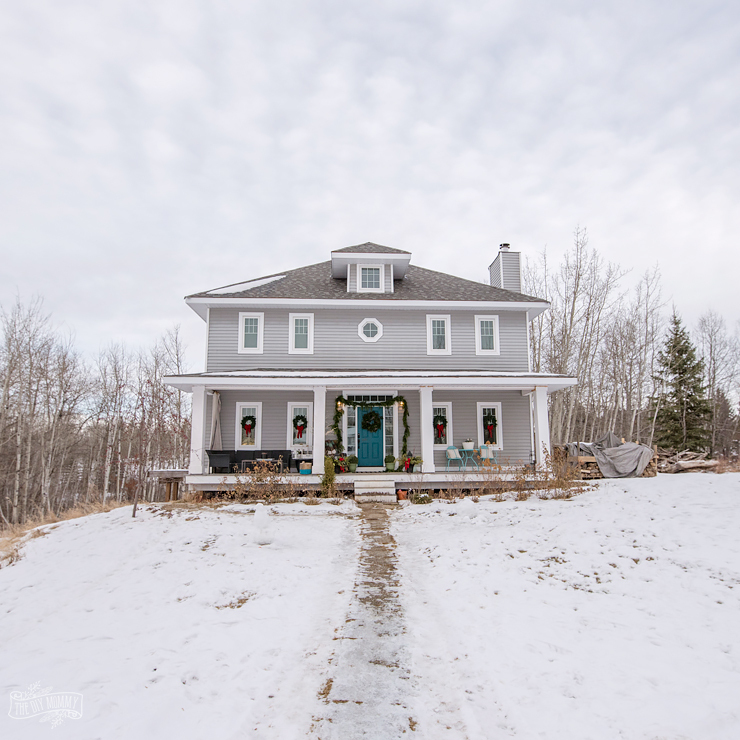 Especially love that wintery exterior shot. Merry Christmas Christina! Beautiful home tour! I wish my whole home was ready to decorate. Love how you always incorporate the teal/turquoise into your home tours. It’s gorgeous! From beginning to end it’s stunning! I have to say though my fave is your dining room, it’s just a show stopper, I can just imagine sitting there and having the best meal ever and having the whole evening melting away just sitting around that beautiful table laughing and chatting and eating all the Christmas goodies, what special family time must be had there! It all looks gorgeous Christina! I love your paper village – the display is perfect for it! I also really need one of those chunky knit blankets. Everything looks so cozy!! Your home is just gorgeous Christina! How have I not seen your beautiful bathroom before?? And of course I’m obsessed with your dining room. Amazing job! Beautiful and cozy as always! I really like the second dining area with all the blue, but the gingerbread scene in the hutch is pretty darn cute 💗 Happy holidays! Absolutely stunning as usual! 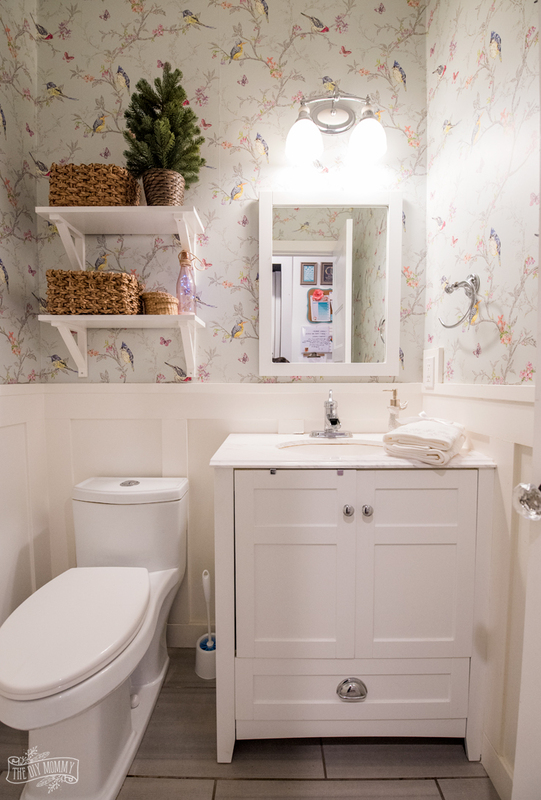 I love that you have a second tree in your dining area and the powder room wall paper has my heart! LOVE! This is looking a haven! 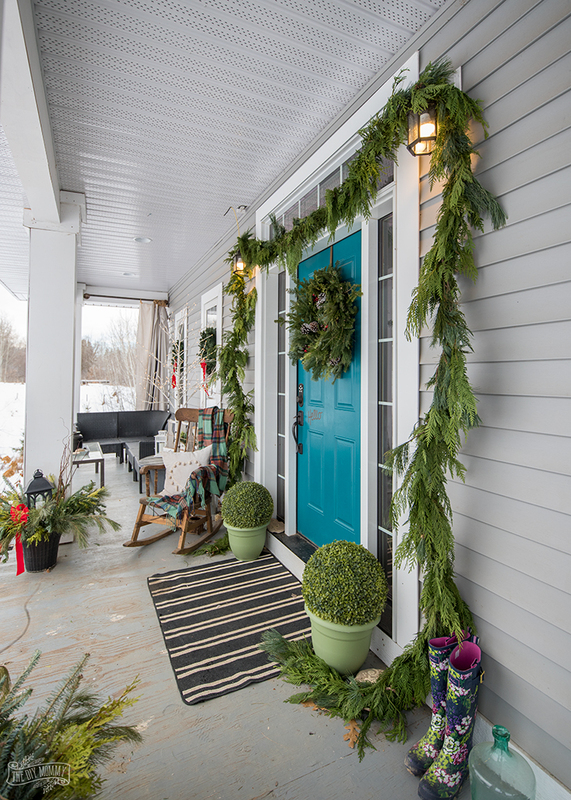 The natural cedar and pine garland in front of your door is looking so much amazing! Absolutely gorgeous, Christina!! 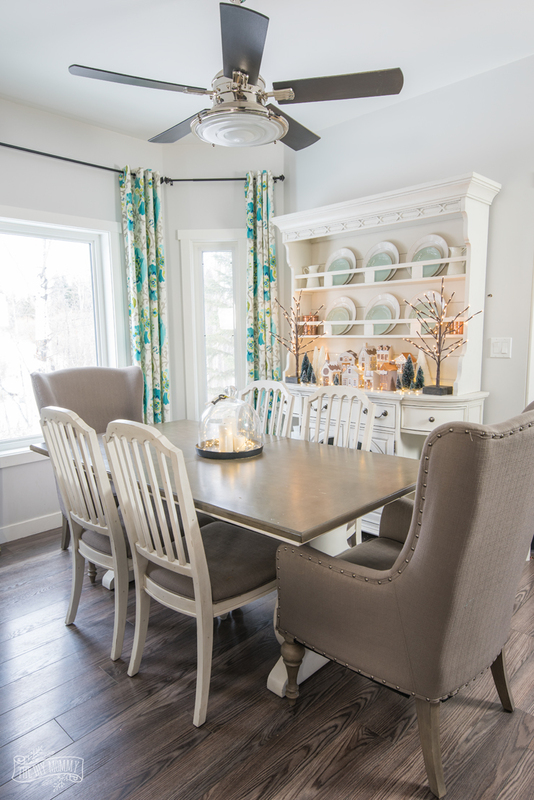 I love love love your dining room! And the pops of pink in your living room and the sweet Christmas village on your hutch! Stunning space! Thanks for organizing:) Merry Christmas!! Christina! I loved your tour! That mantle is so pretty dressed for the holidays. 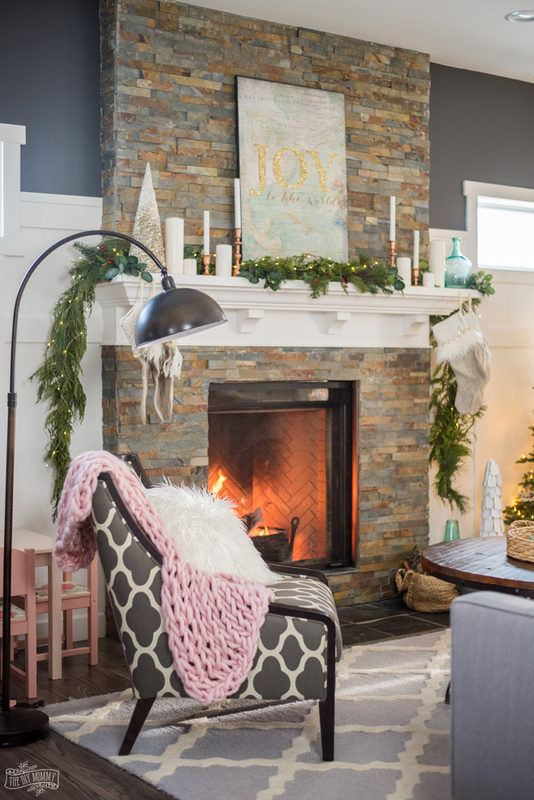 I am putting a fireplace on my list to Santa, it makes your home look so cozy and perfect! Thanks for sharing some inspiration with us. xoxo PS: the doggies on the porch made me smile. 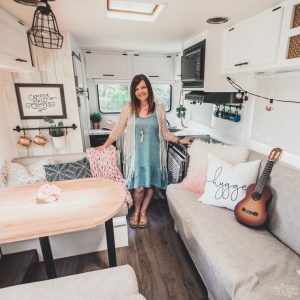 I can’t decide if I love the living room or dining room more – this whole tour is absolutely amazing! Your house looks so cozy and inviting, my friend! What colour/brand is the grey wall colour in your living room – looks very sharp! 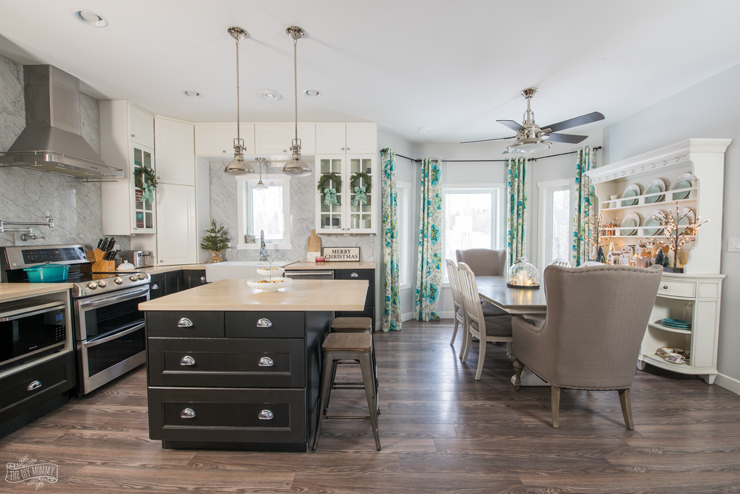 Christina’s light grey is most of the walls on her main floor are Seashell Grey by Valspar. 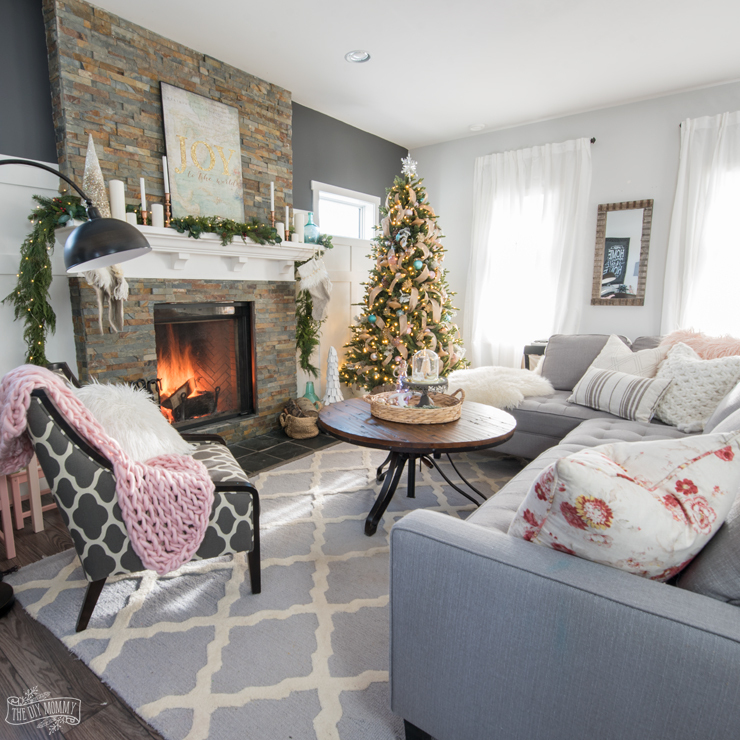 It’s a very light grey with glowing, slightly green undertones.The upper part of the fireplace wall in her living room is a rich charcoal colour called Shades On by Behr.